Why hasn’t Milifandom led to a Labounce? Posted in Politics on April 23rd, 2015 by Leo – Comments Off on Why hasn’t Milifandom led to a Labounce? Views of Miliband have improved sharply but Labour’s vote share hasn’t changed. Given Miliband was often supposed to be a drag on Labour’s vote, this seems surprising. 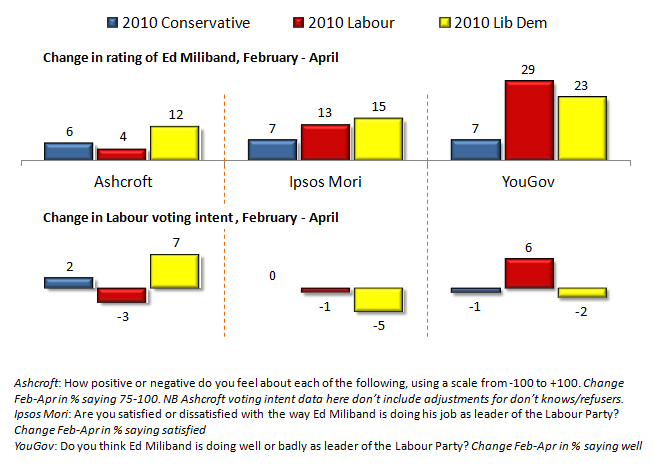 Since February, responses to questions on Miliband have shown a consistent increase in his ratings. This doesn’t just come from people already planning on voting Labour: for example the proportion of Lib Dem voters who say he’s doing well in YouGov’s polls increased from 17 to 34. The 2010 Lib Dems* are particularly important: for the Labour/Tory marginals like Ealing Central and Acton, the votes of 2010 Lib Dems will be crucial, and will determine which party gets the most seats. Their lack of movement is interesting. The Tories planned to run a campaign focused on leadership – assuming that, when pushed to think about who they’d prefer to be Prime Minister, people with doubts about Miliband wouldn’t vote Labour. There clearly was (and still is) a relationship between rating the leader highly and likelihood to vote for the party: in February, Labour voters were 2.5 times as likely as average to think Miliband was doing well; Tory voters were a little over twice as likely. But for Labour this relationship seems to have weakened. I returned to Polling Matters to discuss with Keiran Pedley and Rob Vance what’s changed since the campaign started, what hasn’t and what David Cameron can do to hang on. Are we on course for a Labour Government propped up by the SNP? Since the Green vote share started picking up there’s been a series of articles on the constituencies where they apparently threaten Labour. I’ve looked at the numbers to see how likely the Greens really are to stop Labour gaining seats. Across three articles I’ve seen 19 seats where the demographics are supposed to be favourable for the Greens. Ashcroft has polled 11 of them and we can make a pretty good guess about most of the rest. First there’s Brighton Pavilion, which looks like a safe Green hold. In December they were 10pts up. The Lib Dems look safe in Cambridge (9pts up in March). The Tories will probably hold Wimbledon (11.4k majority) and the Lib Dems will probably hold Leeds North West (9.1k majority). Bristol North West, where the Tories have a 3.2k lead over the Lib Dems and a 6k lead over Labour. This could well be a Labour gain, though that could be prevented if enough 2010 Lib Dems go to the Greens. Bristol West, the main Green target for a gain. The Lib Dems are defending a 11.4k lead over Labour (26.6k to 15.2k); the Tories are third on 10.2k. Without constituency polling it’s hard to know who will win. Colne Valley, where the February Ashcroft poll put the parties on: Con 33; Lab 32; LD 12; Ukip 11; Green 10. The latest wave of constituency polling has showed both Greens and Ukip losing disproportionate support in marginals across the country, as the bigger local parties focus the message that only they can win there. That doesn’t clarify things much in Colne Valley though, where Ukip and the Greens are so close. So of these 19 seats, the Greens will probably win one of them, and may threaten a Labour win in the other three. But these are just the seats where the Greens are expected to do well; they aren’t the only ones where the Greens could swing the result. In about half, the Tories are on course to hold the seats with leads bigger than the Green vote, so I don’t think the Green vote will change much there. However in others, the race is close enough for Green votes to make a difference. In Pudsey, the poll shows a Labour-Tory tie, with 6% planning on voting Green. The same applies in both Rossendale and Darwen and South Ribble (2% Green in both). In Cleethorps, the Tories are 2pts up (3% Green); in both Finchley and Golders Green and Milton Keynes South, Labour are 2pts up with the Greens on 4%. And George Monbiot today listed 16 constituencies where he warned a Green vote could stop Labour beating the Tories or Lib Dems. We’ve seen five of them already. Of the others, Ashcroft’s polls suggest Labour is comfortably ahead, by more than the Green vote, in two (City of Chester; Plymouth Sutton and Devonport). Labour also look to be far ahead in Hornsey and Wood Green, though Lib Dem polls that identify the candidates by name put it much closer, so the Green vote could still be important. Upshot is, this quick search has found around 19 seats (depending on where you draw the line) where Green votes might stop Labour winning – only four of which are those that have been pointed out as demographically strong seats for the Greens. The threat to Labour isn’t just in the liberal and students seats. Note: this article was updated on 16 April to emphasise (in response to comments) that most of the seats where the Greens threaten Labour are generally not those where the demographics favour the Greens, but rather, those that are marginal anyway – and that this isn’t an exhaustive list of those seats. * This rests on the assumption that Green voters would generally prefer Labour in a choice between them and the Tories. It certainly isn’t the case for all of them. But, for example in the latest Colne Valley constituency poll 60% would prefer Labour in government (majority or coalition) vs 40% for the Lib Dems and 23% for the Tories. In the Norwich North poll, it was 73% Labour; 41% Lib Dems and 22% Tory. So in a Lab-Con marginal, roughly 40-50% of the Green vote could be considered net ‘lost’ Labour votes; while in a Lab-LD marginal, it would be about 20-30%. ** The Ukip vote in nearly all of these seats is larger than the Green vote (excluding those where the Greens are expected to do well). And in three of the marginals (Harrow East, Kingswood and Stockton South), the Ukip vote is greater than the Labour lead. So for most of them, you could more easily make the case that Ukip voters are stopping the Tories winning than that Green voters are stopping Labour winning. The Greens’ vote is declining, but were they underperforming anyway? Posted in Climate Sock, Politics on April 10th, 2015 by Leo – Comments Off on The Greens’ vote is declining, but were they underperforming anyway? While recent attention has been on the Labour and Tory numbers – with some discussion about whether Ukip’s support’s falling (it did a bit at the end of March but it’s back up now) – a slide in support for the Greens seems to have gone un-commented on. The latest ten polls, as recorded by May2015, have given them an average of 4.1%: down nearly 40% from their support of 6.7% in mid-February. The decline seems to have started around two weeks after Natalie Bennett’s calamitous LBC interview and has worsened since the TV debate. I don’t have evidence the decline’s connected to her media performances, though I’d be surprised if it’s not. While part of the decline might be the squeeze from Labour and the Lib Dems as voters start wanting to make their vote count* – but Ukip face the same threat and their vote hasn’t fallen (at least not by 40%). So we need another explanation, and the leadership looks a likely one. But, even before recent decline (which is only in a few polls and they might recover from), I’d been starting to wonder, are the Greens underperforming? It might seem strange to even wonder this. They’ll get their best ever result in May and their membership has overtaken the Lib Dems’. But, as their supporters like pointing out, their policies are apparently the most popular of all the parties’; they have more people say they’d vote for them if they could win than either the Lib Dems or Ukip; there’s an unusually large number of left-wing protest voters up for grabs; and their leader has been on TV and radio far more than ever before, including being treated as an equal with the Prime Minister. Yet, they don’t seem to be fulfilling this potential. They’re doing much worse than Ukip, a party who they’re more popular than in terms of both policies and brand. As I showed before, their media coverage is consistently lower than their support should justify: that’s probably part of the reason for the support gap between the Greens and Ukip. But the campaign has certainly given them far more exposure than they had before, and their support doesn’t seem to have responded. So rather noting how well the Greens are doing, should we be wondering whether they should be doing better? * Their new boyband video, weirdly, emphasises several times that [for reasons] a vote for the Greens isn’t a wasted vote. Given how popular George Lakoff is among environmentalists at the moment, I’m amazed no-one spotted that, by repeating their opponents’ accusation, they’re activating the frame of “wasted vote”. 1. Are we prepared for everyone to pay more for less obtrusive sources of renewable energy like offshore wind farms, so that a relatively small number of people don’t have to look at electricity plants they don’t like, particularly onshore wind farms? If so, how much more should everyone pay? 2. How can we continue to expand airports while meeting our emissions targets? If we do continue with expansion where would we make up for the increased emissions? If we don’t, what does that mean for jobs and investment in the UK? 3. Do we need to reduce the amount we travel, internationally and within the UK? If so, how can we do that in a way that doesn’t disproportionately restrict poorer people who’ve benefited from budget airlines? 4. Do we need to discourage growth in particular sectors to achieve our climate targets? If so, which sectors and what will we do to create alternatives for the people affected? And would doing so actually reduce global emissions or just move them to other countries? 5. Are we prepared to make some inconvenient changes to everyday life to reduce emissions, like keeping our homes at lower temperatures, switching to electric central heating and having cars that’re less powerful and with shorter ranges? If so, how can we make sure the burden doesn’t fall most heavily on poorer people and particularly people who would be most affected by lower room temperatures? 6. When we build new homes, should we avoid areas that are more likely to flood when the climate changes? If so, what level of overall global warming should we plan for when we do this? And how can we overcome the increased difficulty this would put on building enough new homes? If not, who will cover the cost when we build in areas that become frequently flooded as the climate changes? 7. What shall we do with existing communities, agricultural land and infrastructure that are flooded more often as climate change increases? Can we afford to always improve defences and clean up after floods, or will we need to abandon some areas? Who decides? 8. Who is responsible for preparing for the effects of increased heatwaves on the elderly and vulnerable? Do we need to take measures to reduce overheating in housing? Should we be preparing community shelters? Who pays? 9. Where should the UK be in terms of its emissions reductions? Should we be at the front to encourage other countries to make bigger cuts, or should we be somewhere in the middle of the high-emitting countries even if that means global cuts are slower? 10. If the UK’s emissions appear to be falling because we make less and import more, are our emissions cuts meaningful? Should we be accountable for the emissions from the production and transport of what we import? 11. Are we – and other countries that have emitted the most greenhouse gases – responsible for the damage caused by the climate change we’re already committed to? If so, do we need to make amends, eg by paying compensation, paying for non-emitting countries to adapt to climate change, taking in refugees where adaptation is impossible? I’m sure there are plenty more. What have I missed?